Biodiesel became big in India in 2002-03. For a country reeling under the burden of a large oil import bill and spiralling oil prices -- 70 per cent of petroleum used in India is imported, mostly from the volatile Persian Gulf region, at the cost of more than Rs 100,000 crore -- it promises an indigenous, renewable source of energy. It also transforms the poorest people and the most marginalised lands into the source for this energy. 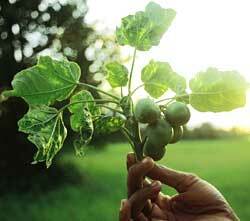 Oil-yielding plants like jatropha (Jatropha curcas to scientists; ratanjyot in Hindi) and pongamia (Pongamia pinnata; karanj in Hindi) are hardy and can grow even in poor soils. This has captured the imagination of scientists, researchers, private companies, NGOs, state governments, farmers groups, and oil and transport companies. The solution is seductively easy: villages grow a large number of oilseed trees; oil is extracted and put through a process called transesterification (to convert it to fatty acid esters, the chemical description of biodiesel, by incubation with alcohol and alkali); this makes it a suitable blend for petroleum-derived diesel. Additionally, biodiesel reduces emissions from diesel vehicles. The initial push for biodiesel came from the Planning Commission. There was a change of government at the Centre in May 2004, and the proposals are still under consideration. A mind-boggling array of Union ministries is eager to support and push biodiesel. In the meanwhile, some state governments and private companies have already taken the cue and started expanding the biodiesel market. All shapes and sizes of private companies are jumping onto the bandwagon; not just to market oil but also to produce oilseed. While this is promising for the biodiesel sector, it raises a serious worry: instead of building on the production base of farmers, it is increasingly becoming a 'venture' for industries, whereby they want to lease large stretches of degraded forestland or so-called wasteland (more often than not, a misnomer for common lands in India) and grow their crops on their own, thereby bypassing farmers or, at best, providing them wage labour. The biggest challenge for the biodiesel programme is: whose land will be used to grow the crops? This will determine who earns from the biodiesel boom. The concern becomes more serious if you consider the number of international companies eyeing India's competitive advantages in producing biodiesel. In Europe, biodiesel blending has been made mandatory. European companies are rushing in to source biodiesel from here. They tout the move as a way of tackling global warming through reduced emissions of biodiesel, as well as helping growth in a developing country. India could become to biodiesel what the Persian Gulf is to petroleum. If this happens, it is a great opportunity. But who will benefit? Will the additional income generated from a rural resource reach the rural producer or not? A first-hand assessment comes from Chhattisgarh, the state at the forefront of the biodiesel rush in India.